My September mini in the nick of time! Can you believe there are only 2 more days until October? If you are a frequent visitor to my blog, you know how much I love vintage feedsacks. I have boxes full of vintage novelty and feedsack scraps leftover from other projects. As you can see cowboy prints are among my favorites. I just started in the center and worked my way outward, cutting as I went along. Wasteful you say? Oh no, the little cutoffs went into my glass jar full of “pieces too small to use, but too pretty to throw away”! The backing is a reproduction, but it is one of my favorites! Sorry Kyle, I hadn't put the label on before I took the photo! It is done now, I promise. Of course, this little guy didn’t make a dent, but it was fun to play in those boxes again! Kyle , Barbara and Janet have posted their minis and you will most definitely want to "click" and see them! They are all worth a visit! I love how different all these little minis are and yet, I love them ALL. And, here's Randy's - It was quilted in September, just a tad late in posting - wink!! I love it! 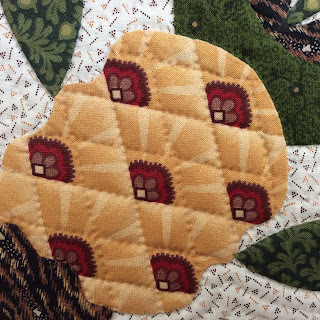 Another “prickly” block in my Noah and Matilda sew-a-long quilt! 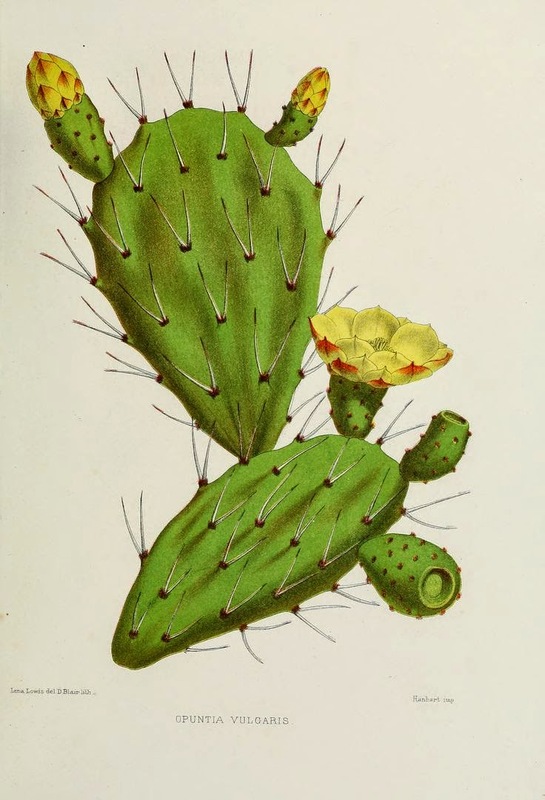 However, unlike the cactus, the pineapple was often seen on mid 19th century album quilts. 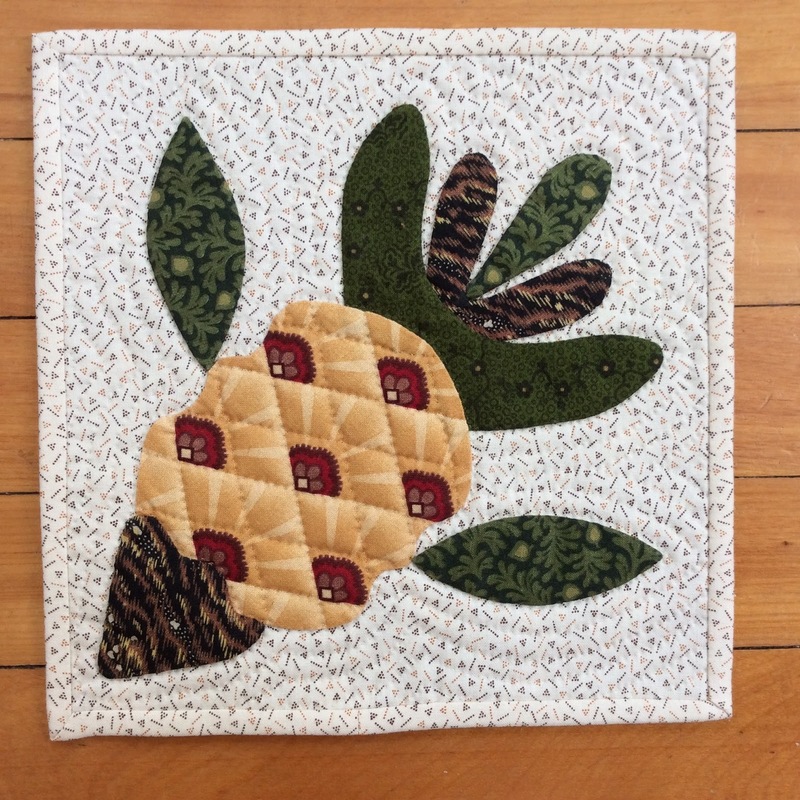 The pineapple motif was a symbol of hospitality and was used as decoration on many household objects. It would have been pretty rare to have a real pineapple in your home in 1850. They had to come from the Caribbean and were frightfully expensive. (Come to think of it they aren’t cheap today!!). I like the original block with its crisscrossed appliqued strips, but when I saw this fabric, it just screamed "pineapple" and I instantly thought of all the time I would be saving if I just let the fabric do the work for me. As I near the end of this project, I find that I am simplifying the process more and more. I know it isn’t a race and heaven knows I can (and really do) work on more than one quilt at a time, but since I have decided to call it my “Ruby Anniversary Cake” I need to finish it in 2018 (our 40th anniversary was in July). I think I can make it if I don’t take on any new projects of this magnitude…. Oops, too late, I hear MaryWitherwax calling my name!! Actually, I owe this entire post to Dawn Cook Ronningen, because not only did she (and her daughter) produce the Noah and Matilda and Mary Witherwax patterns, Dawn's new book arrived on Saturday and - oh wow! It is a fabulous book! 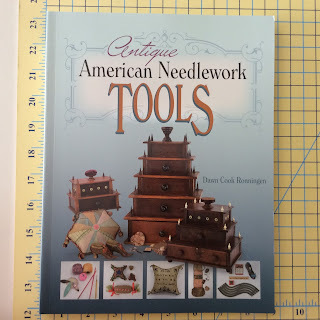 I don't even collect sewing tools, but I have thoroughly enjoyed every page of this. 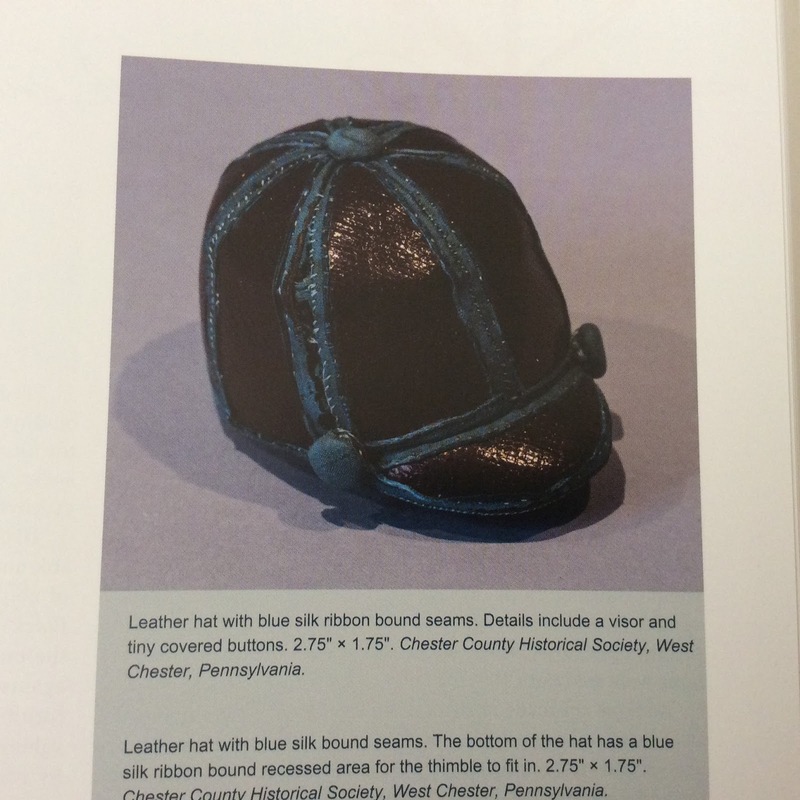 This jockey cap pin cushion is among my favorites. It is packed with wonderful treats like this one. You can order it from her Etsy site (here). Fun! I’m participating in “Amy’s Creative Side” Blogger's Quilt Festival. Check it out (here) and join in the fun! Amy makes it easy to enter. The hardest part will be choosing what quilt to feature! I chose my “Thanks Judie” quilt. I made this as a tribute to Judie Rothermel for her 25th anniversary with Marcus Fabrics. There are over 600 different Judie Rothermel prints in this one. 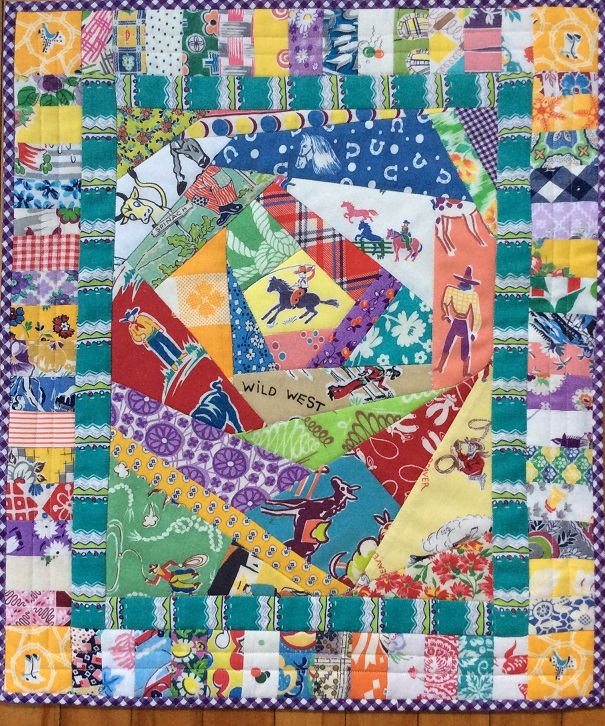 It will be in Houston this year as part of the Primitive Quilts and Projects magazine contest. If you are at the show this year stop by and say hello to it for me! 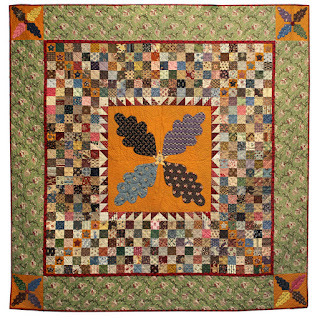 Do visit Amy's blog and see all the great quilts! 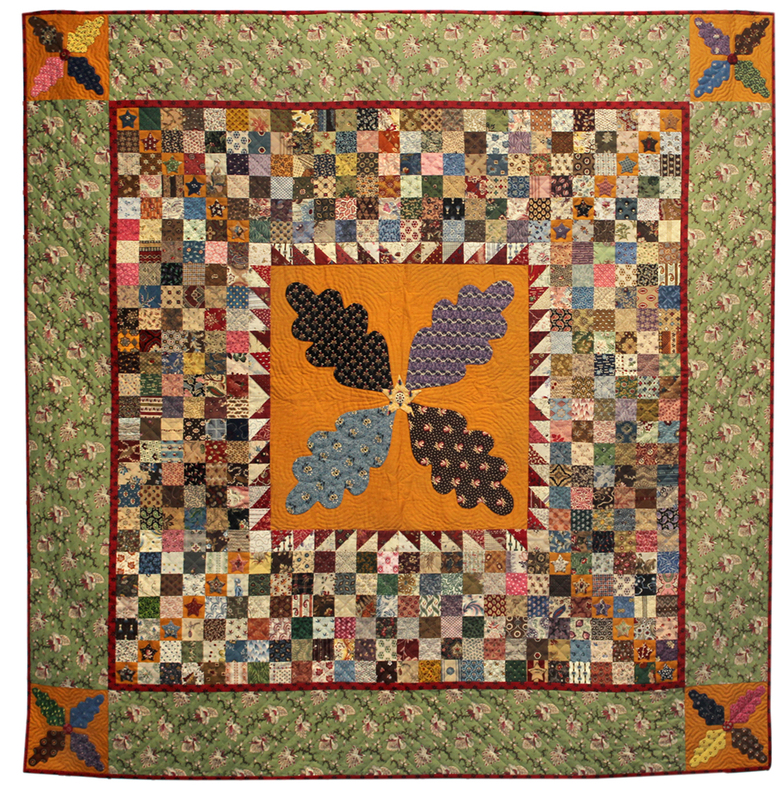 I think it is pretty rare to see a cactus on a mid 19th century quilt and this one has two. The research that Dawn has done so far, finds Noah and Matilda (and family) in Kansas, Illinois and Indiana, hardly cactus territory. One of Dawn’s theories (here) is that the inspiration may have been from botanical prints such as this one. 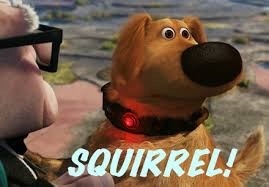 Sounds plausible to me. She is a super sleuth! I had a lot of fun with this one! I used this fabulous fabric that I bought in St. Bart’s (in 1993!) to fussy cut the flowers. I had to really be fussy with the neon fabric in this one. I had just enough of the green portion of this print to fit. As for the greens, I thought these two fabrics looked “prickly”. My latest Noah and Matilda block reminds me of the chokecherry jam my mother used to make. One year the pectin she used must have been bad because it never jelled. With 5 hungry children to feed you just don’t throw it out, so we enjoyed chokecherry syrup for the entire winter. In the spring when my mother poured fresh maple syrup on my little brother’s pancakes, he cried “No, I want the red syrup! Fun memory! I’m trying to get a wiggle on with dear sweet, Noah and Matilda. 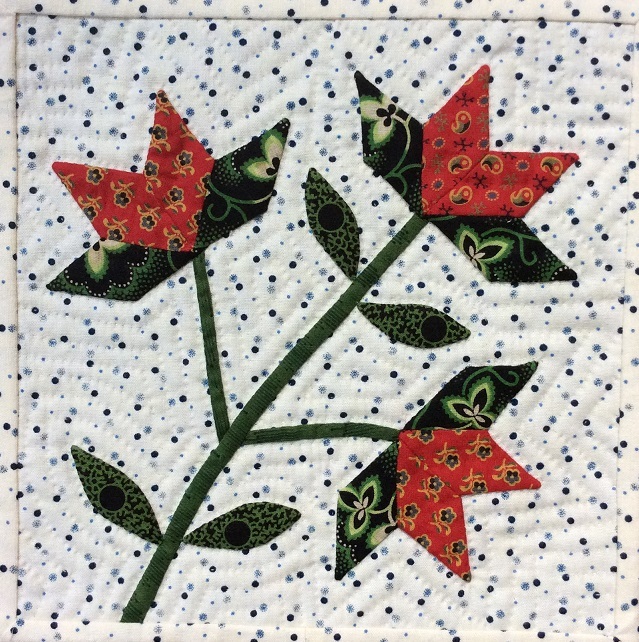 We had our one year anniversary last month, so it is time to finish up and move on to Mary Witherwax and another applique project that has been roaming around my head. More hours please!! Last night I gave a trunk show at the Boothbay Harbor Historical Society. It was very well received despite the fact that there were only two quilters in the room. It is always a challenge to portray what I feel about my work to non quilters. I’m sure the fact that I am also very passionate about quilt and quiltmaker history helped to keep people from falling asleep. 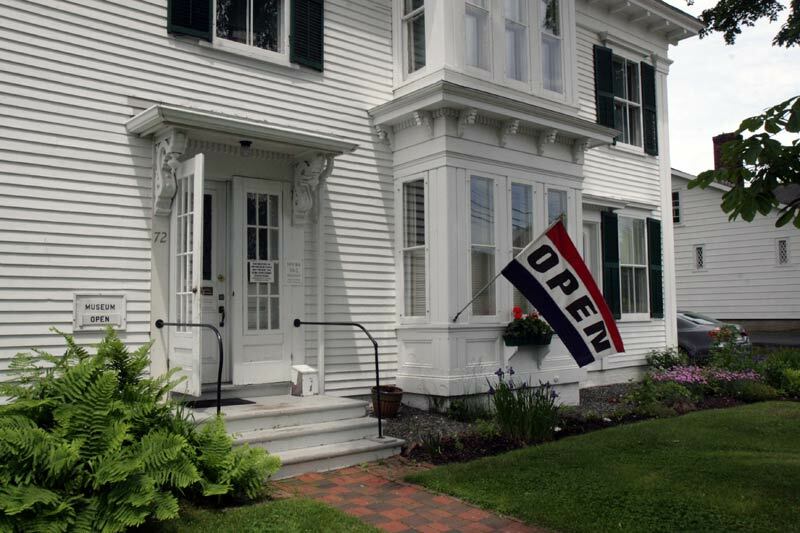 It is a lovely historical society and if you are ever in the area I recommend a visit. 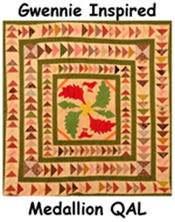 As those of you who do this kind of thing know, it is not an easy task to pack up 50 plus quilts and replace them all in their appropriate living quarters when they return home. Something has to suffer and it is usually my sewing room! Guess I will be doing a bit of straightening this weekend!! As much as I have enjoyed working on my Noah and Matilda sew-a-long, I realize my readers must be getting tired of watching my snail’s pace progress. I just know that you are all longing for me to start something. 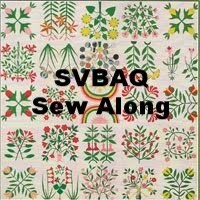 Because I care about all my blogging friends, I have decided to take your advice and start a new applique sew-a-long! Once again, I will be making my journey with the amazingly talented (and productive), Dawn of Collector witha Needle. 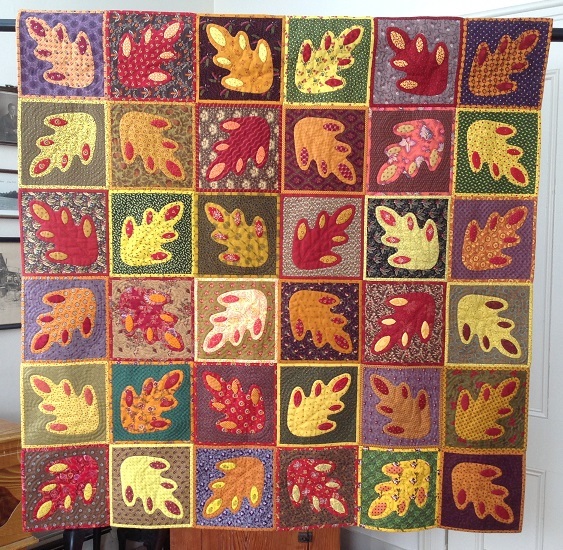 She reeled me in with her amazing reproduction of her Mary Witherwax quilt. I waited 3 whole days before caving in. I highly recommend any of their patterns but, Dawn’s daughter has outdone herself this time. These little gems are beautifully done and, they come with history too! I’d like to invite all of you to join in the fun! You can order your patterns (here). Before you say “I can’t possibly take on one more project”, think about taking it one bite at a time. I may even do a number of smaller quilts to begin with. Dawn has an excellent example (here). And, there is even more inspiration on the Facebook page. When you order the patterns, you will be invited to join the Facebook group. Facebook is often frustrating for me, but Dawn makes it easy to follow and very welcoming! Hope to see you there! I love how this one came out even though I cheated changed the shape of the flowers to circles. I just let the fabric do the work for me!